Disc filters are a flat, circular filter. They are constructed from stacked layers of circular-cut media, held together with a channel gasket around the circumference. Disc filters are primarily used in pneumatic conveyor systems and cabinet filtration. Diluted, semi-dense, and dense phase pneumatic conveyors move bulk materials using low-velocity pressured air. Disc filters for pneumatic conveyors lower the velocity in tubes to minimize wear on equipment. A disc filter is inserted into a vacuum receiver on a pneumatic conveyor. Some equipment features a drawer unit for easier access to the filter element. Disc filters are used for sorting material, cleaning air, and regulating air flow. Disc filters increase efficiency and prolong the life of your equipment. Sidco’s disc filters are a cost efficient alternative to OEM replacements; they are built to fit original equipment manufacturer specifications and are designed to ensure structural integrity during handling, installation, and operation. Sidco offers disc filters in a wide range of sizes, with multiple options for medias and face screens. Disc filters are also known as disk filters, flex filters, or vacuum receiver screens. All disc filters are designed to fit OEM specifications. Designed to achieve equivalent or exceed OEM performance. 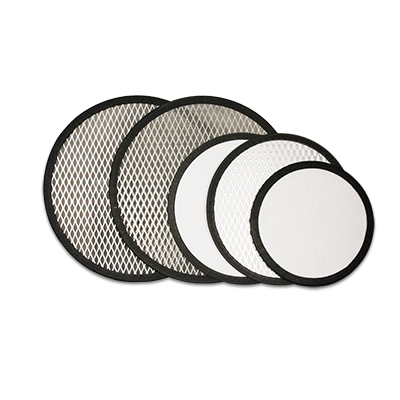 Sidco disc filters are a cost efficient alternative to OEM replacements. Sizes – Made to OEM specifications with custom sizes from 4” to 36”. Media – Polyester felt, polyester felt with a Teflon® membrane, polypropylene felt, woven nylon, standard cellulose paper, stainless steel mesh, stainless steel screen, perforated stainless steel. Seal – Trimlock® channel gasket around the circumference. Support – Backed with expanded galvanized metal for support. Unique Features – Many of our disc filters can be cleaned at the job site. Cleaning your filter element is specific to the media type.